July has come and gone, and with it comes another update. This one will focus on our EV2 builds. July was a very busy month for us, with EV2 in mid-build and the software UX testing ongoing. We’ve got some really great pictures of the prototype parts this update – without further ado, let’s dive in. The EV2 parts have mostly been tested, and the whole assembly will be ready before the product team gets back to Montreal. If all signs are go, we’ll be cutting the tooling next, leading up to our first mass production batch (DV) in October. In parallel, we’ll be working on audio tuning with Onkyo (using EV units), and getting international certification. We’re also building some really cool music features that we aren’t public about yet, which you can read a bit about below. The priority on hardware this month was getting the EV2 batch built – this huge milestone will allow us to very quickly cut the tooling, and move to mass production runs. As of last update, we had finalized the mechanical parts and sent them in for production. We’ve since received back the mechanical parts, and have been putting them through a series of tests to validate that the design hits the requirements. The outer ear cup, along with the pivot attachment. The buttons and charging port look amazing with the right tolerancing. · Validating the color and finish of the aluminum parts, to ensure that the color is uniform across the product. · Testing the feel and sound of the volume buttons, to make sure that there’s no unpleasant clicking sound when they’re pressed. · Checking the fit of the outer ear cup with respect to the accompanying pieces. The clips came out pretty well. These ones have been made using CNC, the final ones will be cast. The logo clips look gorgeous. We will make samples where the logo is not printed, but rather laser etched. The assembled upper band, without the fabric wrap. As always, not everything goes perfectly smoothly – the upper band came with a manufacturing defect. The top portion is made of silicone, which a strip of steel that goes across the underneath to provide structural integrity and the right amount of clamping force. The supplier in charge mistakenly put the wrong type of metal – normal steel instead of spring steel. As a result, the band doesn’t flex as intended: the force is wrong, and there is some permanent deformation when opened too wide. These types of issues are more common than anyone expects. Being present in China, this type of issue is quick to catch and fix. The revised sample, fully finished with fabric wrapping, should be here within a few days. Then the final assembly will be done and the mechanical and electronics test will be completed. The left and right armbands, with the sandblasted finish, look and feel great. We’re testing the sliding tolerancing as we speak. The armbands are a huge part of the headphone experience – they define the feeling of the ear cup pivot, the sliding adjustment, and really hold together the aesthetic. The latest prototypes look incredible and feel great to hold. One issue we’ve had to deal with in particular is the wiring. Between the audio, the power, the grounding, and the electrode wires, we have an above-average number of wires passing through the armbands. More wires mean more volume, and more volume means less room to move. The shielded wires we use in the final assembly. There are over 20 wires going through the upper band. With the flexible mechanism removed on top, volume is no longer an issue in the upper band. Even unrestrained, the wires fit perfectly fine in the volume allotted. The issue comes in the bottom, where the arm band meets the earcup. The sheer thickness of the wire assembly interferes with the motion of the ear cup pivot, causing an uneven friction during motion. We’re currently looking into ways to simplify the cabling in order to shrink this interface, without compromising our decision to include very high-quality shielded wires for the EEG connection. These tweaks will likely be on the electrical side, and won’t impact the current mechanical design. In parallel to packaging everything into the headphones, we have been running tests to validate the signal quality of the various electrode iterations. These tests are best done in a controlled environment outside of the headphones, while we assemble the EV2 for our final sign-off. The image below shows basic modules with electrodes attached on them. Each of those were tested against medical grade electrodes to quantify the quality. We will be release scientific articles in the future to demonstrate how the quality compares. The simple reason why we combine many ways of measuring signal quality is because the nature of dry electrodes like ours is different from classical “wet-type” electrodes. As such, different quality measures are required to fully understand how well they perform across different axes. In fact, signal quality should be measured at the system level, rather than the electrode level. Each component in a signal chain is important in establishing signal quality - evaluating electrodes independently of the system with which they are used does not provide enough insight alone. Exploded view of the electrode assembly. All of this is normally hidden inside the band. The electrode can be screwed in/out of the assembly. Comparison with medical grade electrodes are useful from an engineering perspective, to establish a baseline quality. In the end however, the quality of the electrodes are defined by their ability to deliver high quality concentration predictions to the end-user, a metric our software team is actively working on. Quick snapshot of our electronics engineer validating how well the data transfers between our system, and the basic Bluetooth interface provided by the supplier. 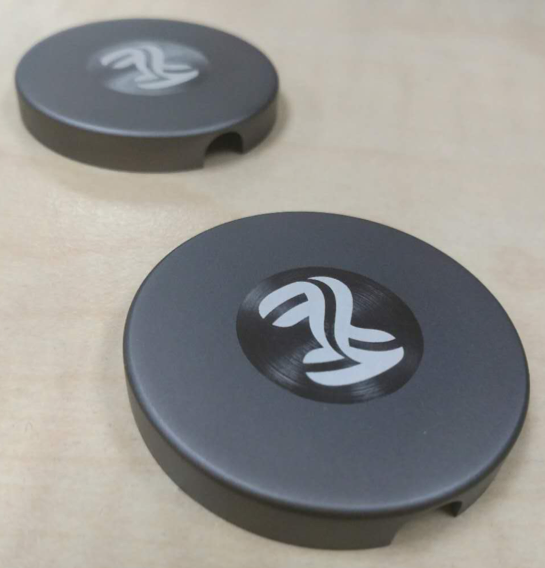 The supplier has his own solution for audio and Bluetooth communications, to which we connect our EEG system. The interface between the two has proven to require a lot of work to ensure that we do not lose any of the audio or EEG data. The blue machine on the left is a signal generator that sends signals into our EEG system to approximate EEG and see the ability of the system to collect and transfer that information to the computer. These tests are best performed outside of the headphones for the moment, as they allow us to isolate the possible problems and establish proper quality requirements. These quality requirements will then be tested for the headphones on the assembly line using pre-programmed test jigs. With all the parts in-hand and tested, the product team is coming back to Montreal next week with the full EV2 batch, to work with the software team on integrating the two parts. Our goal by the end of the month is to have the full stack fully finished: the audio, the EEG streaming, the app interface, the concentration prediction, and the music feedback. For all intents and purposes, this will be identical to our shippable product. The DV phase will produce a batch of roughly 100 fully functional units. These units will allow us to put in place our quality assurance and quality control (QA/QC) systems, which involves determining a baseline value for the hundreds of tests that each headphone will be going through before arriving at your doorstep. From simple verifications of the size of each component, to more destructive processes like fatigue and environmental tests, this process will set the standard for the future production runs. This timeline leads us to October, when we will have 100 units. These units will begin external beta testing (see more below), and will allow us to give a stamp of approval on the production process to begin a batch that we can ship to the first backers. Following DV, each batch will begin shipping more and more units – testing each unit as it comes off the assembly line, while we ramp up production. It’s difficult to predict how long the shipping process will take prior to cutting the tooling, so we’ll continue sharing information in each upcoming update. Most of the parts in the headphone are either plastic wrapped in fabric, or aluminum. The process for making these parts are referred to as injection molding, and casting respectively. These processes involve cutting a mold for each part, melting the material (plastic or metal), and injecting the liquid material into the mold to harden. These molds are referred to as the tooling. The process of taking a design, and producing the tooling, is incredibly difficult – it requires a deep knowledge of material properties and machinery that’s very rare. In fact, the CEO of Apple cites tooling expertise as being the main reason to manufacture in China (https://www.youtube.com/watch?v=eNVvl-yQBWY) (and we tend to agree!). In a simple product, the tooling will cost approximately $50k USD to produce. For a more complex product with several parts, that increases to $100k USD. For a complex headphone product like ours, that price can easily go as high as $200k USD. If we were producing a million units, the amortized cost over the batch would become negligible. For our 5000 unit batch however, this is non-trivial expense. Firstly, I want to reiterate how fortunate we are to be working with an experienced headphone factory. Our ODM produces headphones for Pioneer, Harman Kardon, Sony, and more – this expertise has allowed us to create complex, state of the art designs for integrating our sensors, knowing that their guidance will help us with the tooling stage. Secondly, I want to clarify why this is such a big deal for us: we only have one shot to make the tooling work. Given how critical the tooling is to the success of the product, we need to be absolutely sure that we’re ready before we take the leap. The delays we’ve had so far – adding in the EV1.5 and EV2 stages of design work – were all so by the time we get to the tooling, we are confident that everything will work perfectly. After dozens of prototypes, hundreds of tests, and more design hours than we can count, we think that after EV2 we’ll be ready to take that leap. In addition to the tooling, the first few units of the DV batch will be used to begin the certification process. Before we can send the products out, we need to make sure the products meet regulations and certifications requirements, and receive approval for such. Each country or group of countries have their own set of rules that the product needs to satisfy - for a Kickstarter of our size, having sold in over 80 countries worldwide, this is a complex process, and one that costs upward of $60,000. Our factory has established relationships with the necessary certification boards, which takes the complexity out of our hands. At DV stage, we’ll be sending each of them units to test, in order to sign-off on each branch of testing. On top of the safety regulations and certifications, we need to ensure that the units made from the molds are still satisfying all of the engineering requirements – namely, the hundreds of QA/QC tests we mentioned earlier. The goal is to minimize any potential defects caused by the manufacturing process, and ensure this will scale to mass production – the lower the scrap rate, the quicker we can make the units, and the less likely we’ll have to recall any of the headphones due to errors. Part of this also requires small corrections to the tooling – referred to typically as “rework” – which compensate for small tolerancing changes to the units when we moved from single-production to mass-production. This will take place between the DV batch and the mass production batches, in small iterations as we go, in order to reduce the scrap rate and improve the fit. As we mentioned, moving to the DV phase is a big deal for the product team. In parallel, however, the DV phase also allows us to start something we’re really excited about: public, external software beta testing. We’ve been very quiet about the software over the last months – this is because we’ve been working on something really cool, arguably beyond the scope of the initial Kickstarter promise. Our goal is not to simply track concentration, but to improve it – to adapt the world around you in real time as a function of your flow, to ultimately train your subconscious to achieve what you desire. When we launched the Kickstarter, we were confident in our ability to measure these brain metrics. Over the last months, we’ve been focusing on the second part of that experience: creating a neuro-adaptive system to modulate your musical environment, to improve your concentration and help you get into flow. This is our secret sauce, and we’re really excited about the progress we’re making. By the time we get the DV units, the whole app will be finished – music system and all. Before then, we’ll be reaching out to a few of you (thank you everyone who expressed interest in beta testing!) to get some feedback on a few of the software features we’re working on. This is leading up to October, when we’ll start sharing DV units with some of our backers for feedback, testing, and to potentially start fulfilment. Stay tuned to your emails for more details in the next weeks! That’s all this time! Feel free to leave a comment with any questions, and we’ll share as much info as we can. As always, send any personal questions to hello@thinkmindset.com, and we’ll do our best to give you a prompt reply. We'll replace Mindset if anything breaks within 12 months of ownership. Send us an email, read our FAQs or hit us up on social for fast answers! Mindset are shipped via priority mail. Fast delivery for a fair price.